For the first time in my life for a good while now I’ve been able to stay more or less in one place and I’ve really benefited from the solitude to simply do a lot of reading and discussion online, to grow as a person, as well as the routine of going for long hikes & mountain biking with the dog everyday, immersing myself in the beautiful Welsh countryside. At the same time, I’m really ready to stretch my legs again and aim to start working with more groups like Food not Bombs, going out hunt sabbing and gleaning, visiting forestry centres, rewilding projects & fruit tree farms. I hope I can play a part in building up projects, connections and, where useful, write up or talk about my experiences here. I’m going to start posting all my backlog and future videos to this site because I just think it’s a nicer user experience. People who make articles linking my articles get pingbacks, there’s less of a divide between commenters and creators when people can easily create great text blogs, you’re not distracted by tons of clickbait, only category’s of other posts to look back on, etc. I also recommend everyone getting an RSS aggregator like feedly or inoreader for this reason. It saves you spending hours aimlessly browsing through social media when you can choose exactly who you want to be updated by from various websites. That way any other time you spend online can be limited to meaningfully researching subjects. You can click to read about other ongoing projects I’m working on related to this site. Also, stalled projects, things I still get emails about but have had to put on the back burner for now. 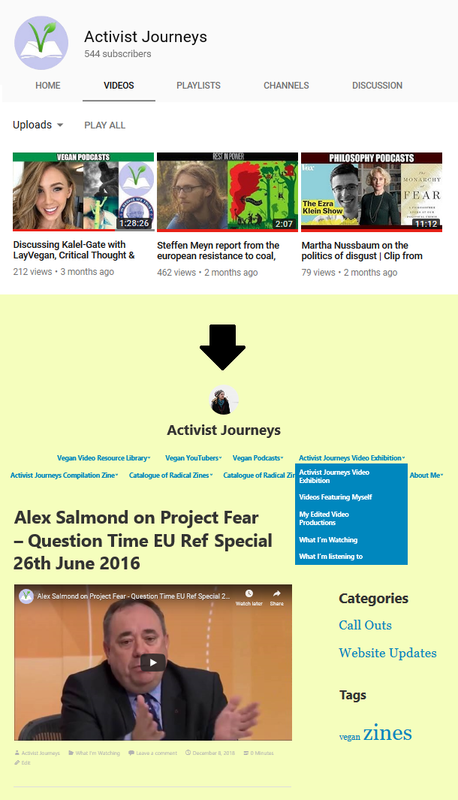 The side bar of links is up, listed in order of things I think will be most relevant to people arriving at this website; vegan & socialist content, campaign groups & networks, adventure and other art/media. It was a nice moment finally getting this resource up as I’ve admired the blog, a girl and her thumb since I was a fledgling and her sidebar of links was a directory of every anarchic project she ever visited (which was a lot). It gave me confidence to keep on exploring. I’ve taken down my first zine of my early years writing. I really liked breaking into the zine world with something significant. It’s just far removed from the headspace I write from now. That said, I’m really grateful for the conversations it opened up and responses it garnered. That’s all my updates for now, have a good one.